Avoid LA traffic with these tips. Want to actually enjoy your vacation? Spend as little of it stuck in traffic as possible. That’s the most valuable info tourists should know to make the most of their time in Los Angeles. When it comes to avoiding LA traffic, there are some tricks for the road that can save you hours of stalled frustration, not to mention hair pulling and obscene sign language to passing strangers who cut you off. If you’re travelling as a family, take advantage of the car pool lane, as its been known to cut 30 minutes off a traffic jam which means an extra half hour you get to spend at the beach instead. Also, if you own a smartphone, stick to Google maps. Since its acquisition of Waze, the app will actually measure traffic to avoid areas of high congestion. Yes, LA is one big sprawl, but it’s actually a massing sprawl that connects many divergent neighborhoods. That means during rush hour you can just as easily skip the highways . You’ll get to tour actual neighborhoods and get a better feel for the city face to face, not to mention avoid the bumper to bumper frustration known as LA traffic. The best advice for avoiding being stuck in traffic is to stay off the interstates at peak times, generally from 7 to 10 in the morning and 3 to 7 in the evening. One of the best ways to avoid LA traffic is to stick to mass transit. LA has an extensive and affordable subway system. You can park at any number of easy to get to stations and take the subway right downtown. You’ll skip traffic jams and never have to worry about parking. Plus, it runs late at night, so you can hit LA’s hip and bopping club scene without having to worry about driving home. It’s also a good way to “people watch” the many facets of LA culture, from punk rockers to multicultural ethnicity to hipsters and skateboarders and anybody else sporting the next trendy style. The train always beats the traffic jam sludge any day of the week. If you really want to avoid traffic in Los Angeles, take the train. Seriously, LA subways are pretty great. They’re safe, cheap, and get you just about anywhere. 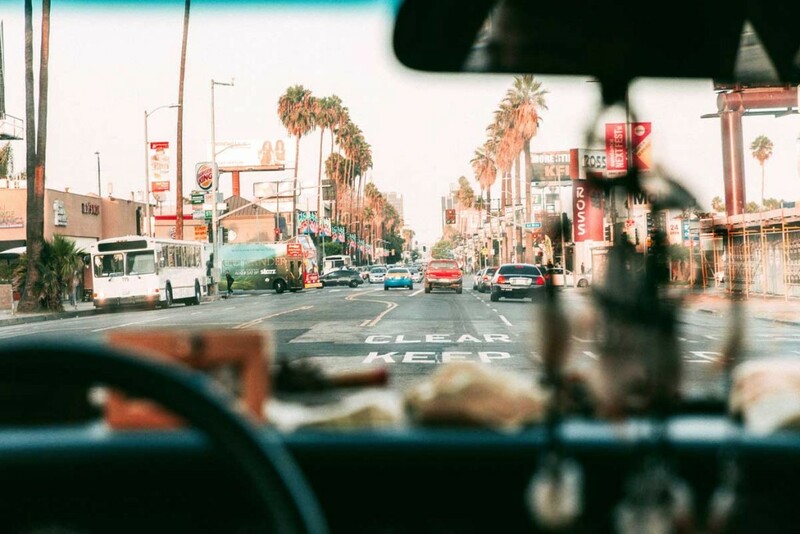 You might consider driving to a nearby station where there’s ample parking, but if you’re planning on going downtown, to Hollywood or hitting Venice Beach, it’s the best. That way you don’t have to worry about city parking and you don’t risk a ticket. And the bus system isn’t too bad either, and fairly inexpensive. And who knows? You might even get to chat up some locals. Find out where’s the best local taco truck. Go Lakers! Crossing the street in NYC is very different to pedestrian culture in Los Angeles. LA County is comprised of 88 cities and all of those cities have their own set of traffic rules. Avoiding LA traffic can mean that you may be surpassing a handful of cities within an hour of driving through numerous streets within the county. If you’re located in one of LA’s major cities like Santa Monica, Pasadena, Long Beach or DTLA, you’re in luck to have various shops and public transit within walking distance of each other. Avoid LA traffic and start walking. Becoming a pedestrian is a sure way to not deal with traffic in LA, just make sure you read the signs and watch for cars to be safe. Looking for creative activities in LA to get some kicks for the weekend? Take a tour of the California Institute of Abnormalarts (CIA, for those who get it), a museum that began by two guys who decided to collect the freakiest art on earth. You’ll find pickled fetuses, preserved dead bodies, funhouse mirrors, and even a few wax pirates. Or you can visit the Palms Thai Restaurant on Hollywood Boulevard for a performance of the Thai Elvis featuring the King’s greatest hits. For some hard hitting roller derby, catch a match of the LA Derby Dolls, a full contact derby match featuring beautiful women to boot.